Relax and celebrate any special occasion with your friends and family at Helena's Day Spa. Let us help you create an experience that is as memorable and relaxing. What type of events are held at Helena's Day Spa? Do you offer same day wedding parties? Let us help the bride-to-be and groom get ready to walk down the aisle for their special day. Bring along the entire bridal party – both bridesmaids and groomsmen – for some pre-wedding pampering and relaxation. We offer a hair salon area and a makeup station to help you get ready for your big day! If you have your own hair stylist or makeup artist, please have them come in early before your event to allow them to get familiar with the facility and set up their station. 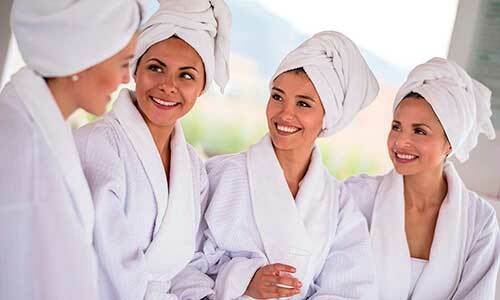 A group event is considered as four or more people within a group receiving spa services. We also have a “Lady in Waiting Service” that is highly recommended for groups. A non- refundable deposit and a credit card number to secure all appointments booked are required to schedule a group event. We know that things happen, so we try to be very accommodating to the things life throws our way. We require that any changes or cancellations be made within one week of the start time of the group event. Any no show appointments will be charged full service amount to the organizer’s credit card. For group parties a 18% charge will be automatically added to your account. Do you offer food or beverages? We offer complimentary wine and tea during your Spa party. You are more than welcome to bring cold food, snacks, and your own personal drinks for your spa event (Please note that hot food is not allowed in the spa as these aromas affect the experience of your party and others). We can customize your packages or you can click below for our packages suggestions.